It should never take more than 5 minutes to whip up a good coleslaw! 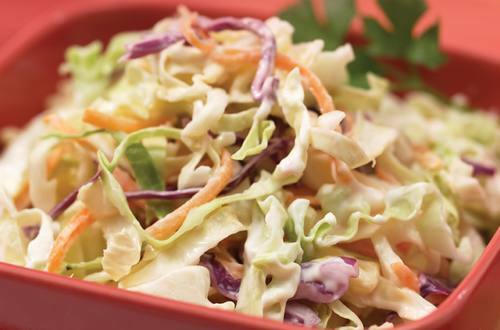 Follow our quick and simple coleslaw recipe for a tasty side dish that's a perfect complement to any burger or sandwich! 1 Combine Hellmann's® or Best Foods® Light Mayonnaise, lemon juice, sugar and salt In large bowl. 2 Add coleslaw mix; toss well. Serve chilled or at room temperature. Also terrific with Hellmann's® or Best Foods® Real Mayonnaise, Hellmann’s® or Best Foods® Canola Cholesterol Free Mayonnaise or Hellmann's® or Best Foods® Low Fat Mayonnaise Dressing.